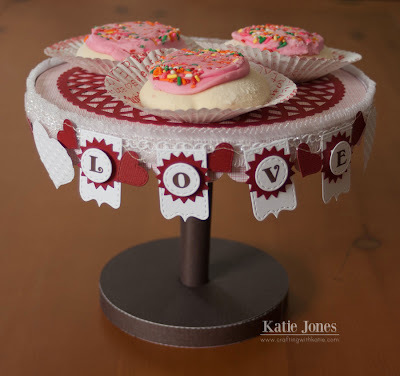 It's 3-D Wednesday with My Creative Time, and I've got a cake stand to share with you today that is completely made out of paper! I used the adorable Lori Whitlock file from the Silhouette Store and then cut it at its original size. Lori has a great video showing how to put this together. I also cut a beautiful Lori Whitlock doily in red to adhere to the top. Since the top of the cake stand is 8" in diameter, I cut the doily at 7". I also added some pretty 3/4" Pleated Glitter Trim from Liz's Paper Loft Boutique with my glue gun, to give it some extra sparkle. For my banner, I used the My Creative Time Build a Banner Kit and Anyday Bingo & Crossword for the lettered elements. I never get tired of these dies!!! 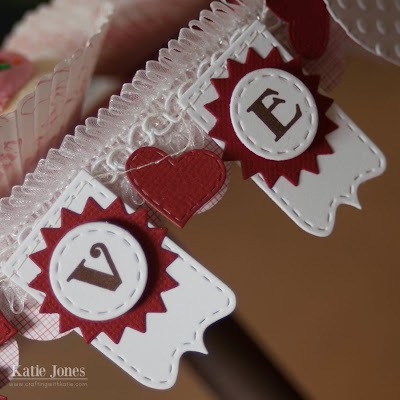 I also used the Stitched Heart Layering Dies to make my red hearts and the heart from 100% Sweetness to make the white ones, which I also embossed with the Cuttlebug Polka Dots embossing folder. I sewed the whole banner together with my sewing machine, and then used my glue gun to adhere some of the elements to the trim. 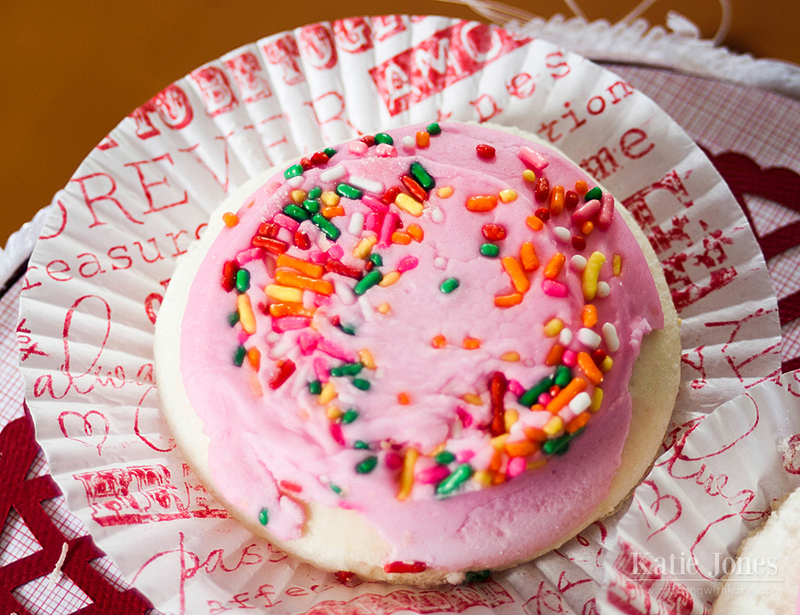 I didn't want these yummy cookies messing up my cake stand, so I put them in white cupcake wrappers. Since that didn't look too exciting, I stamped the wrappers with the Love Collage Background Stamp. Perfect! Be sure to click on the link below to visit Emma's blog to see what she and the rest of the design team have created for you today! Very cute Katie! So adorable. I am def going to check out this file from Lori! Love it....well done. what a cute idea gosh I love it have to keep this one in my thoughts for sure...gosh you are creative!!! Wow! 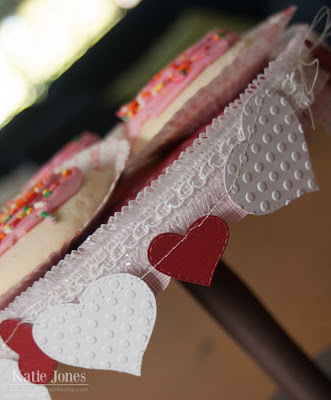 I thought your cute banner decorated a purchased cake stand. TO find out you created that too is just amazing! I love it. Perfect bakesale item. Been looking at that cake stand from Lori. Really cute. Love the stamping on the cup cake wrappers. this is so adorable, love the banner going around the plate !!! oh gosh this is just adorable!!!!!! The cute banner around the edge is darling!!! What a great and cute idea. I must check the how to video as soon as i get a chance. Thanks for sharing. Katie ~ I have to say this is one of my FAVORITE projects of yours! I LOVE the cut and what you did with it! The banner ( ssewed together) the trim, the doiley on top and then those wrappers ~ Oh my goodness!!! Seriously this turned out AMAZING!! Plus I LVOE the paper/color you used for the pedestal!! Awesome creation!!! What a cut this cake stand is! Wow! Then you decorated it perfectly with a ton of MCT products. I love how you machine stitched the banner part and stamped the wrappers...great idea! Thank you so much for taking the time to share (& it's so helpful the way you link all of your products/supplies)! katie, this is AMAZING!!!! the details are just over the top! WOW! I TOTALLY THOUGHT it was a REAL plate! EXCELLENT job my friend!